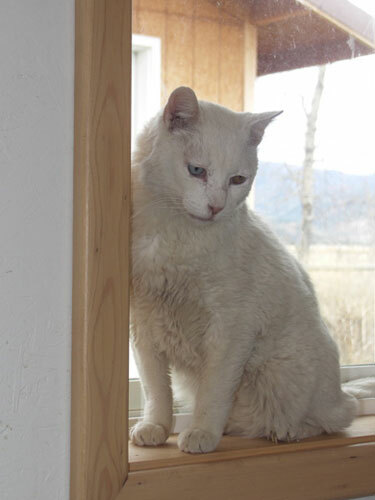 Snowball came from a ghastly animal hoarder case in the Flathead Valley. A woman had more than 100 cats in a house, and long ago gave up keeping it clean. Cat feces were literally 8 inches deep on the kitchen counters, and the floors were impassable, filled with feces and garbage. 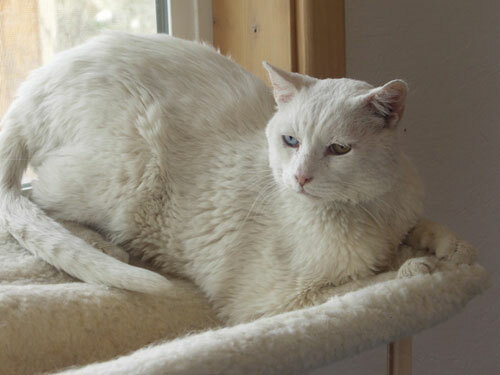 The local Humane Society was trying to place the cats, and asked if we could take a deaf white one. 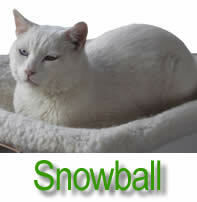 Snowball arrived with a chronic upper respiratory infection and a mouth infection. Weeks of daily medications helped get the upper respiratory infection under control, but our vets had to pull half a dozen teeth to make progress on the mouth infection. 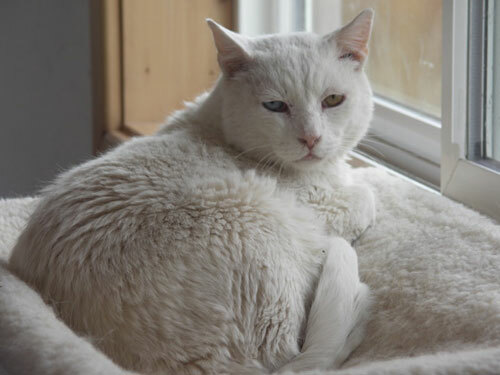 In addition to being stone-deaf, Snowball has two different colored eyes. One is blue, the other a light brown, almost hazel. He is a sweet, mellow fellow who gets along with everyone. Today this easy-going gentleman enjoys sunning himself in the windows of our cat house. He thinks everything is looking (and smelling!) much better these days!